We present a new set of parton distributions, NNPDF3.1, which updates NNPDF3.0, the first global set of PDFs determined using a methodology validated by a closure test. The update is motivated by recent progress in methodology and available data, and involves both. 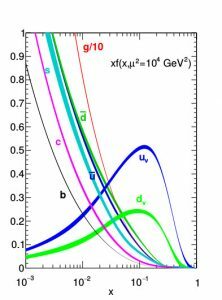 On the methodological side, we now parametrize and determine the charm PDF alongside the light quarks and gluon ones, thereby increasing from seven to eight the number of independent PDFs. PDF sets are available below and at the LHAPDF6 website.